Grown from aqueous saline solution buffered with citrate at pH 7.3, this calf thymus DNA single crystal demonstrates birefringence and the beginning of a focal conic texture. The DNA concentration for this specimen is unknown but is presumed to be in the neighborhood of 400 milligrams per millimeter, and the magnification is approximately 200x. 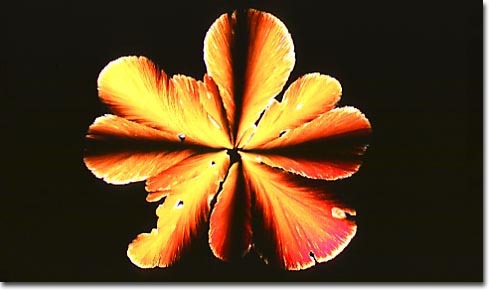 The digital image presented above was originally recorded on Fujichrome 64T transparency film using a Nikon Optiphot-Pol microscope with crossed polarized illumination. Exposures were recorded about 2.5 f-steps under the recommended value given by an in-camera photomultiplier and were push-processed approximately 1.5 f-steps in the first E-6 developer.